It's only been two days since the closing ceremony of the 2018 PeyongChang Winter Olympics, and I must admit I'm two days longing to bring back the emotions and exhilaration these games brought into our very cold month of February. A true form of escapism, I diligently tuned into the CBC live coverage and highlights each and every day, to be gently slipped away to the other side of the world where so much activity and excitement was happening, watching with anticipation and cheering on all the Olympians who worked so hard for years. The feature event for me was watching our country's darling ice dancing favourites Tessa & Scott inspire and warm our hearts once again. Yes indeed, this free dance was inspiring and just plain beautiful. And we had plenty of other great triumphs and moments to celebrate, marking this one victorious Olympics to remember. Many athletes leave with medals in hand, ready to celebrate their victories and losses. After all that grueling training and months of hard work they definitely earn their fair share of an indulgent meal--or indulgent curry, shall we say!? We have the perfect indulgent curry for a 'treat day', trust me to look no further! This would be Shahi Paneer which is almost like a double decadence. First there's the smooth, silky and creamy curry sauce laced with aromatic spices, cumin and chilies with bites of fresh ginger shreds. This is a curry sauce that can stand all on its own and will have you licking your plate at least twice - it's that good! But then comes the paneer. 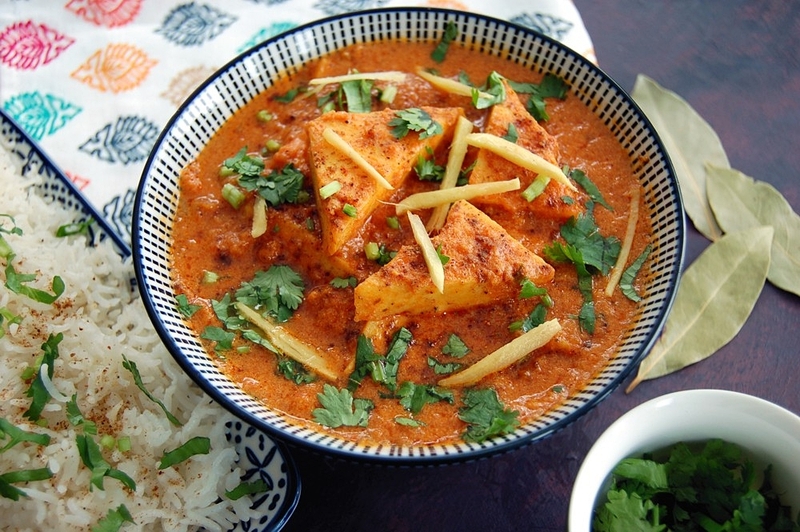 Bits of soft, creamy paneer have a melt-in-your-mouth-feel after simmering away in the curry sauce. Another bite with some cumin scented basmati rice and you may just be able to take away the winter blues. 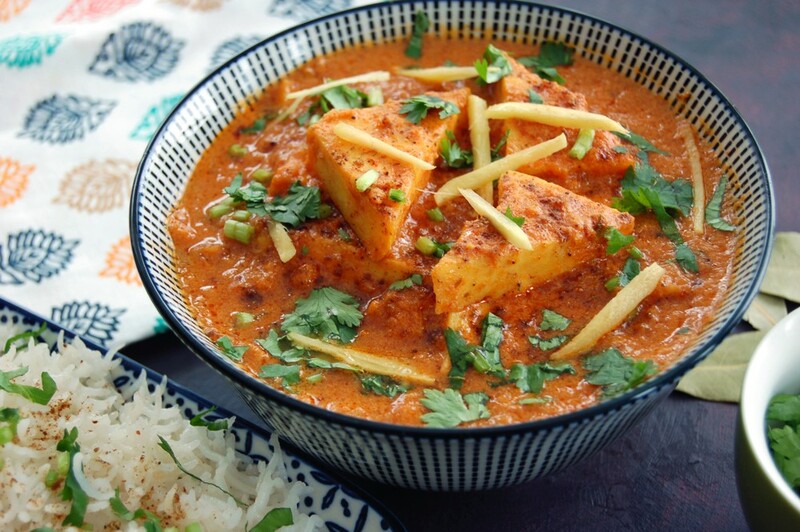 1) It's tradition to cut the paneer into triangles (instead of cubes), as at banquets or buffets guests will be able to identify this dish as Shahi Paneer and not a different paneer curry such as Matter Paneer. 2) Be sure to finely julienne ginger into shreds for a beautiful garnish. 1) Boil onion in water until softened and cooked. Drain and purée in a food processor until smooth. In a heavy-based pan, heat oil on medium-high. Add onion and cook until caramelized, approximately 10 minutes. Stir in crushed tomatoes and cook for one minute. paste. Add water and mix to create a sauce. Add ginger, sugar and lemon juice. water to get desired sauce consistency. Simmer for a couple of minutes. Remove in a serving dish and garnish with cilantro and a sprinkle of ARVINDA’S GARAM MASALA. Serve with basmati rice and chappatis. Printable full recipe is here.